8 Marriage Proposals In Malaysia Which Will Make You Want To Up Your Game! Last Monday we talked about wedding proposals in Singapore that have make us go “awww”. Not to be beaten by the romantics in Singapore, Malaysians too have strived to prove their love in the most creative and unique of ways to their partners. So here are 8 guys who have given it their all to put other proposals to shame and indirectly ‘spoil the market’ for other hopeful singles. Singapore or Malaysia, who did better? You be the judge. Forget about proposing on land, do it in the sky. Oh just another day of window shopping at a store… Nope! Because proposing in a mall, restaurant, or park is too mainstream, this Malaysian did it on Mount Everest! This guy pulled a show stopper by displaying his proposal on the giant screen right in the middle of Bukit Bintang, Kuala Lumpur. AND in a mascot costume. This will surely make you see memes in a different light. The couple took a photo together with Santa Claus who was sitting on a stage in a shopping mall. When the couple was ready to leave, Santa Claus asked them to take one more photo together and things started to get “complicated”. And top off this special list..
Our very own Malaysian editor was just proposed to last year. 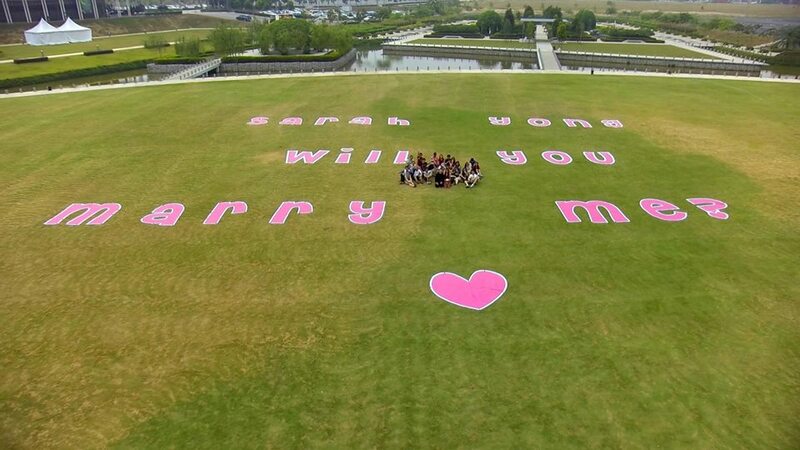 Her (now) fiance and their friends cut out huge letters one-by-one to spell out the marriage proposal question in a field such that it could be seen from the sky as they flew across the area in a Cessna aircraft. An added bonus is that he took 5 months to personally design the engagement ring himself!